Big Mac candle offers 30-hours of cheeseburger aroma, and people are lovin' it. I don't know if this heralds the apocalypse or is the best thing ever. We can probably blame KFC for its 11 Herbs & Spices Firelog for starting the trend and sending us all down this aromatic spiral. Australian retailer Grey Lines is offering the ultimate home addition for Big Mac lovers around the world. 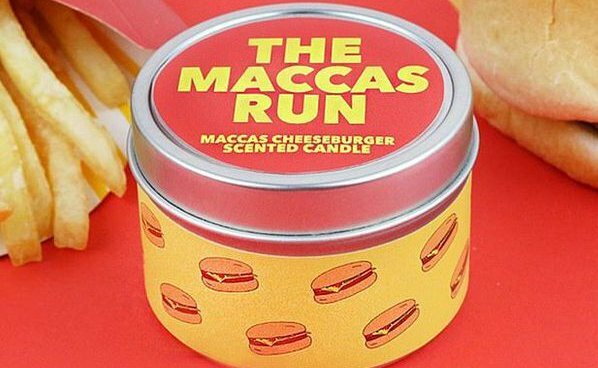 This candle, called The Maccas Run (Maccas is slang for McDonald's in Australia), is a long-burning illuminary with hints of beef, bun, onion, pickle, ketchup, mustard, and cheese. In fact, it will give your home a certain eau de cheeseburger for up to 30 hours. My best guess as to who the evil genius is behind this candle. Courtesy of GIPHY. "When cheeseburgers are life. If I can’t eat them, might as well smell them," said one potential buyer. Another said, "Think how much money we could have saved at college if we had this." While the candle is currently not on the Grey Lines site, you can hold yourself over with one of its many other candle scents, including Garlic Bread, The Man Cave (beer scented), Girls Night In (popcorn scented), and a whole lot more. My personal fav: Kanye's Ego Filled with Self Love, Arrogance and Conceitedness, which is cookie dough scented. Does this candle sound mouthwatering or meh to you? Let us know in the comments.